CSIR UGC NET 2019 June Exam Admit cards at csirhrdg.res.in, Exam date: June 16: How to download CSIR UGC NET 2019 admit cards, CSIR UGC NET Exam pattern, CSIR UGC NET Exam Centers, CSIR UGC NET Exam date. 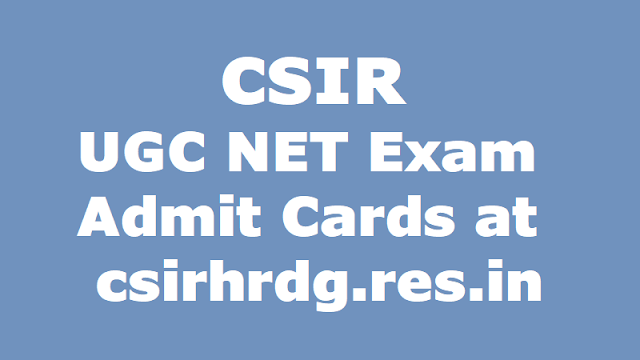 CSIR UGC NET 2019: Council of Scientific and Industrial Research (CSIR) Examination Unit has activated the admit cards link for the UGC NET 2019 exam scheduled to be held on June 16, 2019. The examination is held to test the eligibility of the aspirants for the award of Junior Research Fellowships (JRF) NET. Also, through UGC NET, the eligibility for appointment of Lecturers (NET) in certain subject areas is determined. The Council of Scientific and Industrial Research (CSIR) UGC NET examination is scheduled to be conducted on June 16, the admit card of which will be released on the official website, csirhrdg.res.in soon. One released, the candidates can download the admit card from the official website. The Council of Scientific and Industrial Research, CSIR released the date of CSIR-UGC NET examination date 2019. The exam is scheduled on June 16, 2019. On-line applications for JRF/NET are invited twice a year. Candidates may check the Notification on HRDG website, csirhrdg.res.in. As per the notification released, the exam would be conducted from 9 am to 12 noon for Life Sciences and Physical Sciences. While, exam for courses like- Chemical Sciences, Mathematical Sciences and Earth, Atmospheric, Ocean and Planetary Sciences would be conducted at 2 pm till 5 pm. CSIR and UGC provide Research Fellowships to bright young men and women for training in methods of research under expert guidance of faculty members/scientists working in University Department/ National Laboratories and Institutions in various fields of Science. Candidates appearing for CSIR-UGC NET Exam must fall under the age limit of 28 yaers.They must be M.Sc or equivalent degree/ Integrated BS-MS/BS-4 years/BE/BTech/BPharma/MBBS with at least 55% marks for General (UR) and OBC candidates and 50% for SC/ST, Persons with Disability (PwD) candidates. Students may check further information on eligibility, exam pattern on the official website. The link for which is provided here. Check the official notification of CSIR-UGC NET 2019 Examination. Date sheet released for CSIR-UGC NET Exam 2019. CSIR NET 2019 admit cards: The Council of scientific and industrial research(CSIR) has released the admit card for Joint CSIR UGC NET exam 2019 on the official website at csirhrdg.res.in. The Joint CSIR UGC exam for Junior Research Fellowship and Lectureship will be conducted on June 16, 2019. Candidates can download admit card from the official website using their form number and date of birth. The exam will be conducted for Chemical Sciences, Earth, Atmospheric, Ocean and Planetary Sciences, Life Sciences, Mathematical Sciences and Physical Sciences. At the time of result, CSIR will release two separate merit lists one comprising of the candidates qualifying for the award of Junior Research Fellowship (JRF NET) and the second, of those candidates qualifying the Eligibility Test for Lectureship (NET). The final result of CSIR NET will be declared in September/ October 2019. The fellowship to successful candidates will be effective from January 1, 2019 with the validity period of two years for joining the fellowship under CSIR scheme. Step 3: You have to enter your Application Form No. and Date of Birth and the security code. Step 4: After entering all the details, click the ‘Login’ button. Step 6: The page will appear showing the CSIR NET Hall Ticket. Step 7: Check the CSIR NET Exam Admit Card with every detail mentioned in it. Step 8: Download it and take a printout of the same for the further use. The exam will be conducted on June 16, 2019. The exam will be conducted in two sessions: 9am -12 noon (morning session) and 2 pm-5 pm (afternoon session). The exam duration will be of three hours and will carry a total of 200 marks. ‘The candidates will not be able to leave the examination hall before the deadline of the exam. The candidates are permitted to take the Test Booklet with them at the end of the exam. Step 1: Go to the official homepage of the CSIR: csirhrdg.res.in, Step 2: On the homepage, click on ‘e-Admit Card for JRF/NET June 2019 Exam’ link flashing towards the bottom of the page, Step 3: A new window will open, Step 4: Enter your form number, date of birth and security code, Step 5: Click on login, Step 6: The admit card will be displayed, Step 7: Download and take a print out. The exam will be a single paper to be held in morning and evening session. Multiple Choice Questions (MCQ) will be asked. The exam is conducted for life science, Earth science, Mathematical science, Chemical science, and Physical science. Further, the exam is held for life science, Earth science, mathematical science, chemical science and physical science. CBSE will conduct the next UGC-NET for Junior Research Fellowship & Eligibility for Assistant Professor on June 16, 2019 at selected cities across India. The CSIR UGC NET 2019 examination is held to test the eligibility of the aspirants for the award of Junior Research Fellowships (JRF) NET. Also, through UGC NET, the eligibility for appointment of Lecturers (NET) in certain subject areas is determined.